Our Hotels are situated in prime seaside resorts and major cities, close to some of the most scenic areas across the UK. We at Britannia are proud of everything our hotels have to offer, not just in terms of affordable accommodation, but also when it comes to food, drink, and especially LIVE entertainment. As such, it hardly comes as a surprise that, each year, we prepare a glossy brochure, to let our guests know everything they can expect when booking one of Britannia's plentiful entertainment packages. From film nights to musical concerts and from discos to game nights, Britannia's range of entertainment options is almost as wide as its range of hotels across the UK – and thanks to our carefully prepared brochure, guests can find out exactly what is on at any given time of the year, at any given location. Our latest brochure, currently free to download on our website, comprises entertainment events taking place in 2019. In it, guests can learn all about a variety of different events taking place at any number of our hotels, as well as familiarise themselves with our various other popular packages. With rates from as little as £20 per night, which includes our Big Britannia Buffet Breakfast, Dinner and fabulous Entertainment - there’s no reason to hesitate! 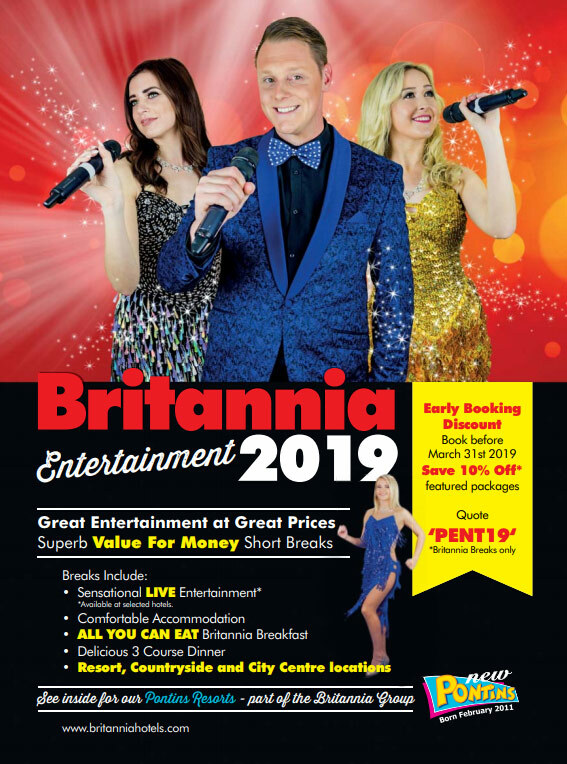 Click here to view our 2019 brochure, guests' one-stop guide to Britannia entertainment throughout the year.